Tuesday’s school board meeting while the union report was delivered. 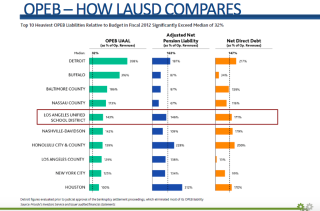 As district officials and other analysts pick apart the UTLA-funded study released Tuesday that claims that independent charter schools drain half a billion dollars from LA Unified, the district’s own numbers show LA Unified actually makes money from charters. The first finding of the 42-page union-funded Cost of Charter Schools report states that the revenue collected from charter schools does not cover the annual budget of the district’s Charter Schools Division. But that’s not what the district’s own numbers reveal. In January when the Charter Schools Division presented its budget, it showed that the district receives half a million dollars more than they need to pay for the division. That report, presented to the Budget, Facilities and Audit Committee by Charters Division Director Jose Cole-Gutierrez, showed that the 1 percent oversight fee collected from charter schools brings in $8.89 million while the annual expenses of the division’s 47 employees including their benefits total $8.37 million. The UTLA report puts the indirect administrative costs of the division at $13.8 million, including the cost of the square footage of space used in the Beaudry headquarters by the staff, janitorial costs and time managing and investigating charters that could be spent on traditional schools. These costs, it states, are not supported by the 1 percent oversight fee collected from charters that is used to fund the district’s charter schools division. The UTLA study notes the district doesn’t charge the charter schools the full 3 percent it says they could charge for the 56 schools that are located on district sites. That could result in an increase of $2 million for the district, it says. School board member Monica Ratliff pointed out at Tuesday’s board meeting that many of her constituents ask why the full amount is not collected from the charter schools. The report was immediately criticized by district staff and others, as both inaccurate and an attempt to divert attention from far larger drains on the district’s finances. District officials have been directed to refrain from commenting officially, but they are planning to respond to the report as early as a special school board meeting planned for Tuesday to discuss the budget. An initial analysis by the Associated Administrators of Los Angeles (AALA), the district’s bargaining unit for middle managers, also noted that the district’s own figures for its charters division contradicted those in the UTLA report. AALA reported that a district official said the number of charters contracting outside the district for special education — and the ensuing financial impact — was vastly misrepresented in the UTLA report. And it questioned whether UTLA was reading the regulations on charter fees correctly and whether the district could charge charters a full 3 percent. 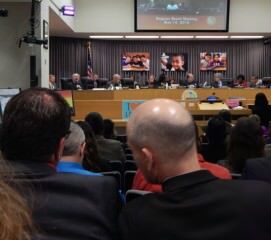 The UTLA report comes as the district is facing a potential $450 million deficit within three years due to declining enrollment and increasing fixed costs, including pension costs, legal liability and other post-employment benefits. The report was but together by a Florida-based consulting company, MGT of America, and Susan Zoller, a former teacher and administrator who compiled the report, presented it to the school board on Tuesday. Unfunded pensions, which currently top $13 billion and have more than doubled since 2005, make LA Unified the only school district on a list of top 10 government entities across the country that can’t afford their pensions — the top spot going to the city of Detroit. In January, a company that has performed independent audits of LA Unified for seven years told a school board committee that the district had gone into the red for the first time, with liabilities outstripping assets by $4.2 billion, in large part because of having to report $5.2 billion in retiree pension liabilities. Another drain on the district is chronic absenteeism which results in an annual loss of $139 million in revenue. Increasing attendance in schools by only one percent — which would make it equal to the average in the state — that could bring in $45 million a year, according to district figures. UTLA itself is facing financial trouble. This year’s UTLA operating deficit was estimated at $1.5 million, fueled in large part by increased costs for staff retiree health benefits. To address the losses, UTLA President Alex Caputo-Pearl this year called for and won a $19 per month dues increase. At another meeting of the Budget, Facilities and Audit Committee Meeting, in March, findings from a 2008 RAND study of the impact of charter schools on the district were cited, which indicated charter growth would not be the district’s greatest financial threat. The Independent Financial Review Panel last fall also stated that enrollment declines were all but inevitable and charters were not the issue. * This report has been updated to add the AALA analysis and the Independent Financial Review Panel’s findings on enrollment decline.